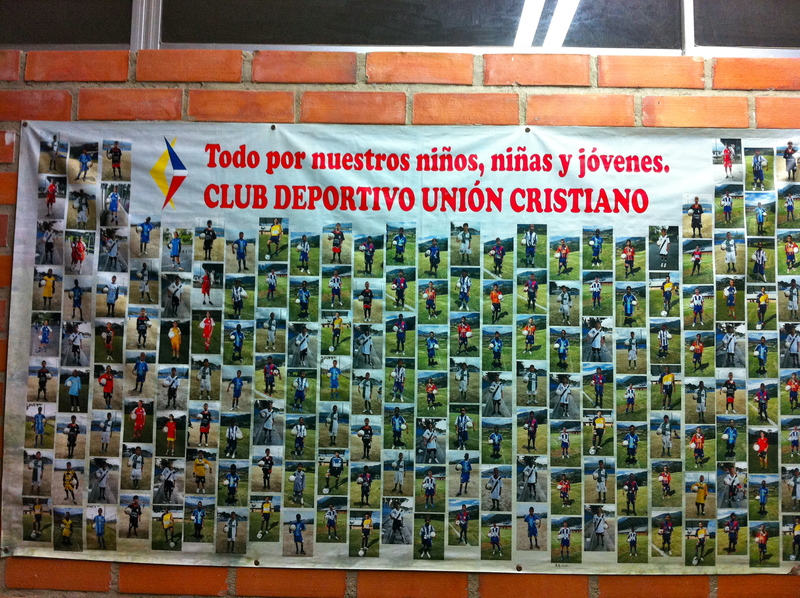 February 27th, 2012: Medellin, Colombia: Our jaws dropped when we arrived at the Club Deportivo Union Cristiano stadium where we stayed in Bello, Medellin for the last 7 days. Not only is the stadium a state of the art project with a professional size grass field and a synthetic field being developed, but also it is against a backdrop of beautiful mountains, lush vegetation and birds flying high in the blue sky. There were many times during the sessions when Nick and I both found ourselves transfixed by the environment around us because of its beauty and size and because it offered us a view of Medellin and its surrounding neighborhoods. (CDUC). 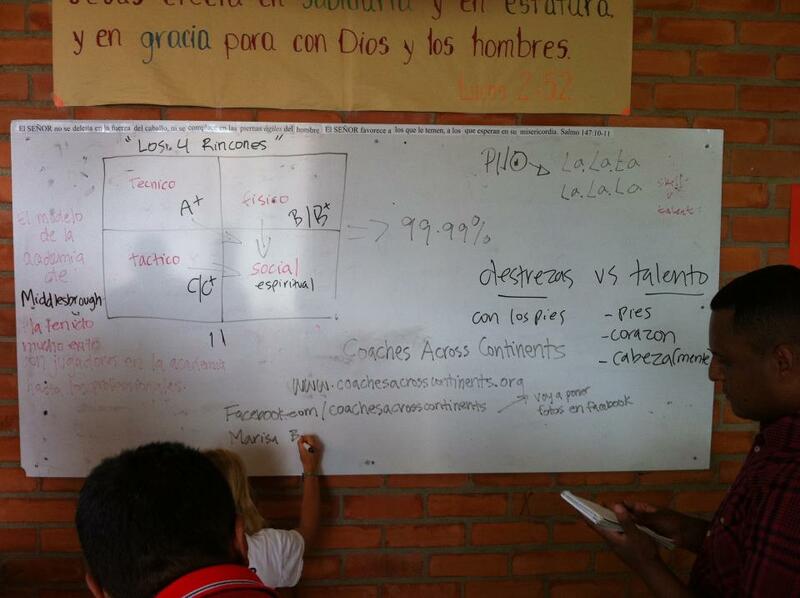 The club works in many sectors of Medellin delivering programs to more than 1,000 children with a staff of 20 employees. 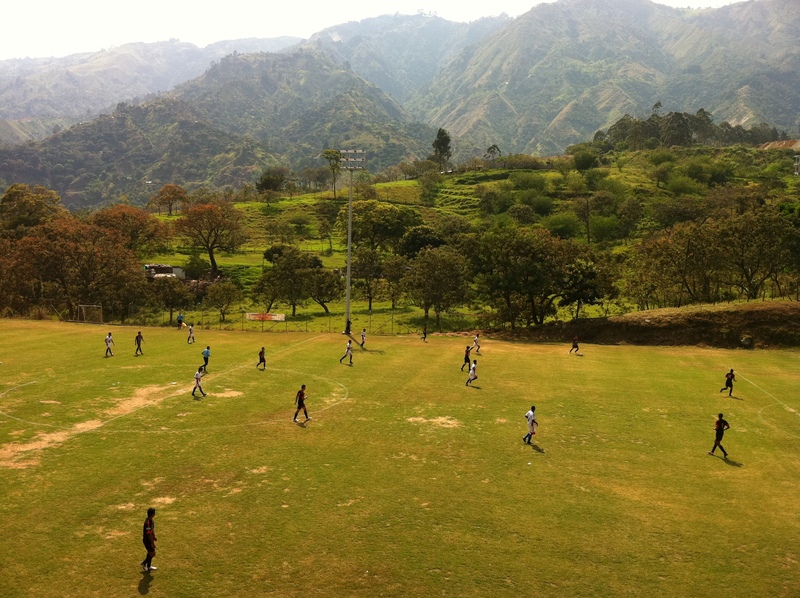 Marcos Wittig started the organization in 1991 as a simple neighborhood soccer tournament and since then it has grown to include a year round tournament that includes more than 50 teams, a brownie business venture and the Medellin Sports and Retreat Center on more than 5 acres of land. The club has maintained its focus on offering football as well as guidance to living a life based on Christian values/principles. We accompanied some of the coaches to see how they managed their trainings and to take part by teaching some of our games from our CAC Chance to Choice curriculum. Much of the adventure was arriving at the field after long rides up the mountainsides. We were always guaranteed a beautiful view of the city no matter where we landed as well as a group of skilled players who were passionate about playing football. Traveling to the different sites also allowed us to see the many sides of Medellin and through conversation with coaches and our guide Davinci, we learned more about the gang culture and violence that still plagues many of the neighborhoods. Davinci relayed to us a story about a young footballer who recently crossed over into another neighborhood in order to get to his final destination, and was shot simply because he wasn’t from that neighborhood. It is hard to even imagine that scenario when we were told that even for people living in Medellin it is hard to know where one neighborhood ends and the other begins. During our trainings with the coaches we focused on teaching the differences between football development and football for social development. It was very interesting to learn the club’s perspective on their social impact within the community, of which the spiritual aspect is a large component. Many coaches were interested in learning how to teach their players how to think and make quick and good decisions on the field. It presented great opportunity for Nick and I to teach games that required players to make good decisions on the field and then to further connect that ability to a player’s life off the field. We finished our training with a session filled with innovative games that stressed teamwork, good choices and problem solving. We were incredibly impressed by the solutions the coaches presented as well as the enthusiasm that some of the more experienced coaches displayed for adapting football for social development into their programs. Que agradable fue conocer de ustedes y gracias por compartir sus talentos con nosotros.